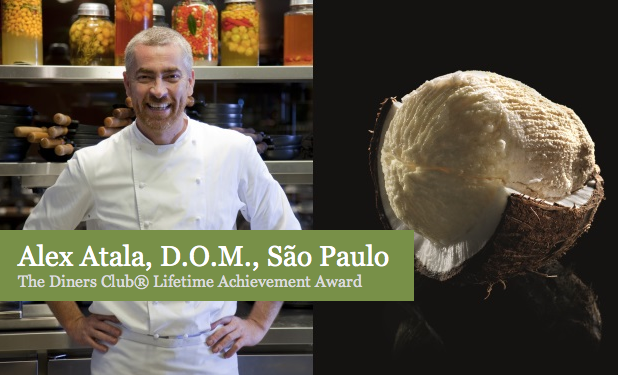 Brazil’s Alex Atala has been awarded the Diners Club Lifetime Achievement Award for Latin America for 2014. Atala will be presented with the award at the Latin America’s 50 Best Restaurants ceremony, which takes place on 3 September 2014 in Lima, Peru. With his ground-breaking D.O.M. restaurant in São Paulo, Alex Atala has helped put his country’s cuisine on the global gastronomic map and simultaneously changed the way food is served at establishments across Brazil. Atala’s ultimate aim for the restaurant, which opened in 1999, was to change the history of modern Brazilian cuisine by embracing and refining traditional family dishes that were hitherto considered too homely for fine dining – and he has succeeded. As a result of a pioneering approach to the nation’s bounty, indigenous produce such as acai, pupunha and cupuaçu are now celebrated in high-reaching restaurants and are beginning to creep into the kitchens of the US, Europe and beyond. Moreover, the club-DJ-turned-chef has played an important role in discovering and championing forgotten and lost ingredients through expeditions into the Amazon, aided by scientists and anthropologists. Atala is the epitome of the modern chef: his cooking embraces new techniques and creativity, while retaining a deep-rooted cultural identity. As a result he has become an inspiration for chefs not just in Latin America, but across the world. This entry was posted in Brazil, São Paulo and tagged Alex Atala, Brazil, São Paulo by Critical Divide. Bookmark the permalink.